As technology, generational gaps, and other factors change the ways people interact, leaders can develop emotional intelligence to help adapt. Emotional intelligence is a set of emotional and social skills that influence the way we perceive and express ourselves, develop and maintain social relationships, cope with challenges and use emotions to understand others in an effective and meaningful way. How well we develop and use these abilities greatly affects how well we live our lives, do our work, and interact in community. 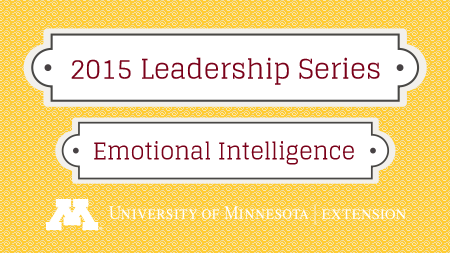 Participants will take an online assessment called the Bar-On Emotional Quotient Inventory (EQ-i 2.0®). The EQ-i 2.0 is the first scientifically validated instrument to assess emotionally intelligent behavior. Extension Educators Catie Rasmussen and Mike Liepold will provide participants with a deeper understanding of core emotional intelligence skills and help participants create a plan to enhance their skills in building effective relationships, interpersonal growth, and self-management. 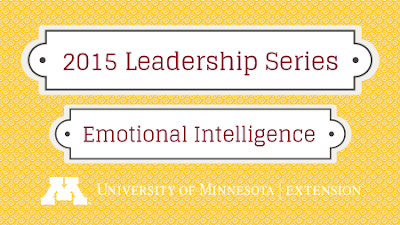 Participants will receive a link and instructions for taking the Bar-On Emotional Quotient Inventory after the registration deadline on Monday, July 27, 2015. The assessment must be completed by August 4, 2015. COST: $175. University of Minnesota Extension is subsidizing some of the costs per participant, which typically run $250 or more. Space is limited so sign up now to reserve your spot. Registration closes Monday, July 27, 2015. Register now.